Friends of Noe Valley Recreation Center will host their second free Elementary School Fair on Sunday, September 23, from 11 a.m. to 2:30 p.m. Representatives from about 40 public, private and parochial schools in the southern portion of San Francisco will be on hand to answer questions and talk to curious parents. Parents for Public Schools will host enrollment and marketing workshops, and they will also have an information table set up in case the workshops fill up. Staff from the Recreation and Parks Department and the San Francisco Public Library will also be there. The League of Women Voters will be available to register voters. If you haven’t registered, please do. There will be several important propositions on the November ballot. San Francisco voters will be asked to pass Proposition B, which would authorize $195 million to continue to improve the city’s parks and recreation centers. State voters will be asked to vote on two propositions —Props 30 and 38—-that will be crucial for maintaining funds for our public schools. For more voter information, click here. You can find more fair information like a map of area schools, school links, and information on the public school lottery process (including request statistics from last year) on our website, www.noeschools.com. The fair is hosted by FNVRC and sponsored by Children’s Day School, Stratford School, UrbanSitter.com and Whole Foods of Noe Valley. Several classes still have low enrollment and will accept drop-in participation, including yoga for adults, theater for tweens and Baby and Me for tots. Petite Bakers, a cooking class for 3- to 6-year-olds, has only three students. Bring your little Julia Child Tuesdays from 10:30 to 11:30 a.m. and try one class for $4! Baby and Me, which requires adult participation, teaches 18- to 36-month-old tots dance-related activities, basic dance steps, stretches and classroom etiquette. Classes are on Wednesdays and Fridays from 9:30 to 10:30 a.m. All drop-in classes for tots cost $4 each. All adult workout classes—yoga, bootcamp, pilates—have space, so now is the time to drop in on a class to see if it suits you. There is also still room in the Friday theater class for 8- to 11-year-olds from 3:30 to 4:30 p.m. Drop-in classes for adult and youth classes cost $10 each. Please see a complete list of classes by day (with descriptions) on our website. Spend your second Saturday at the ninth annual Music in the Park, a community picnic featuring bands, burgers and jumpy houses. The festivities take place at Noe Courts, the park on the corner of Douglass and 24th streets. Staff from Upper Noe Recreation Center will be on hand to organize dodgeball games, among other delights. 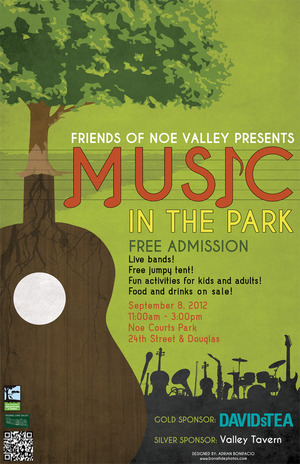 For more information, visit Friends of Noe Valley. UPDATE: Rec and Park staff will go the extra mile for us and come close the sandbox on Mondays and Tuesdays, so we no longer need a volunteer. Now what about that CRC position? Have you noticed the new sign posting sandbox hours? 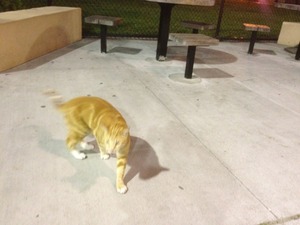 These correspond to the times center staff are available to re-cover the sandbox at night. At this point, we desperately need parents to pitch in and cover the sandbox on Sunday and Monday evenings when the center is closed and not staffed. If you are there alone one of those evenings, please assume you are the last person available to re-cover the box. If there are a couple of families, talk to each other about putting on the cover and maybe do it together. "Even if people just cover the sand instead of pulling it all the way over the cement, that’s good enough,” said Cheryl Woltjen, Upper Noe’s Facility Coordinator. The November ballot includes important state propositions and local bond issues. State Propositions 30 and 38 would provide crucial funding for our public schools. The San Francisco "Clean and Safe Neighborhood Parks" bond, Proposition B, would authorize $195 million to continue to improve the city’s parks and recreation centers. If you are a busy parent or work out of San Francisco, you can register to vote by mail using an absentee ballot. It’s a convenient and easy way to make sure your voice is heard in this year's election. Voting by mail allows you to vote early and on your own timeline. You can choose to vote by mail when you register or request to vote by mail with the San Francisco Department of Elections. The deadline to register for the November 6 General Election is October 22. You can pick up a registration form from any library, post office or county elections office. You can also find the form online here. Print it out, sign it and mail it to the address on the form. Forms must be hand delivered or postmarked by October 22 to be valid. Upper Noe Recreation Center needs at least two more people to serve on its Community Recreation Council. Every rec center in the city has a CRC, which meets monthly to help determine what programming would best serve the residents of the surrounding area. This month we are losing the fabulous Karen Spira (of sandbox cover fame), who has loved getting more involved in the community but must take time to focus on family and finishing her studies at Berkeley. We need a replacement for her as well as someone to fill an already vacant seat. Please visit our website or contact Facility Coordinator Cheryl Woltjen for more information. Woltjen can be emailed or reached at the center by calling 415-970-8061. UPDATE: Noe Valley Smiles and Braces regrets to announce that the “Noe’s Got Talent” Show has been cancelled. Please call 415-678-5445 for more information. 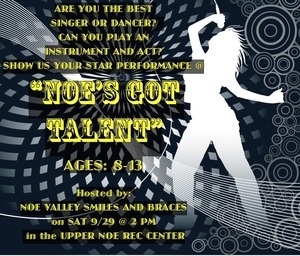 Tweens with talent can strut their stuff on Upper Noe’s stage Saturday, September 29, during the Noe’s Got Talent show at 2 p.m. Hosted by Noe Valley Smiles and Braces, the contest will feature acting, singing, music and dancing from creative 8- to 13-year-olds. “We want to do a couple things a year that are fun events for not only our patients but everyone in Noe Valley,” said spokeswoman Nicole Smith. San Francisco native Dr. Shahram Nabipour opened the Smiles and Braces storefront at 3932 24th Street in early 2011. Since then, he and his practice have supported local events and traveled to schools to hand out toothbrushes and good advice. Proceeds from the suggested $2 door admission will benefit the center. “We’ve done a couple of things with the Upper Noe Rec Center before, so we thought it would be great to be able to sponsor the UNRC and hopefully make a little bit of money for them,” said Smith. Prizes will include gift packages with iTunes cards, lessons offered by local artists and other goodies. Children ages 8 to 13 are invited to submit routines by Monday, September 17, at noon. All routines must be approved by the Talent Show Board. For more information, visit www.noevalleysmilesandbraces.com or call 415-678-5445. Representatives from about 40 public, private and parochial schools in the southern portion of San Francisco will be on hand to answer questions and talk to curious parents. See www.noeschools.com for more details. Who among these 8- to 13-year-old musicians, actors and dancers will take top prizes? Come see at the neighborhood talent show, sponsored by Noe Valley Smiles and Braces. Jumpy house, jumpin' bands, and barbecue to boot!